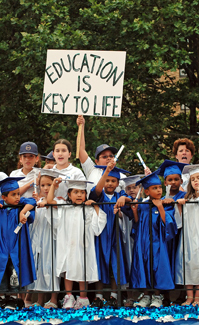 Can Obama's blueprint fix Bush's education policies? President Obama is proposing a substantial overhaul of the No Child Left Behind Act, the controversial centerpiece of George W. Bush's educational policy. Both liberal and conservative critics say the eight-year-old law has hurt education by overemphasizing standardized tests and unfairly labeling schools as underperforming without providing help to improve. Obama wants to focus federal enforcement on the lowest-performing schools, which could be required to fire staff, convert to charter schools or close altogether. He also wants to hold teachers more accountable for student performance. State policymakers and many experts are welcoming the proposed changes, but the powerful teachers' unions say firing teachers is unfair and ineffective in raising student achievement. Obama also wants states to adopt national “core standards” developed by the states' governors and education chiefs.